England earned a hard-fought 49-38 win in the opening game of their three-Test series against South Africa in Bath. The home side made a lacklustre start but edged into a 22-20 half-time lead. And as England began to settle, shooter Pamela Cookey extended their lead. Head coach Anna Mayes told Sky Sports: "A win's a win, but I'm disappointed with the up and down nature of our performance." The remaining Tests are on Wednesday at Wembley Arena, and Friday at Worcester. Captain Cookey added: "There was a lot of nerves coming into the game. South Africa came out strong and we're a bit disappointed with how we started, but I'm pleased with how we finished. "We know what we can do. Never did we think the game was beyond us. We knew we had it in us, we just needed to keep plugging away." 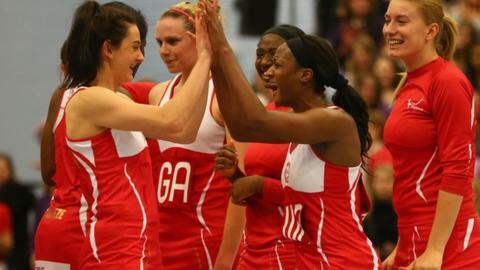 England, whose only defeat this year came at the hands of Wales in the Netball Europe Open Championships where they fielded an U21 side, secured a first-ever series win over world number ones Australia earlier this year, whitewashing them in the process. But South Africa, who have not beaten England in a Test for 13 years, took advantage of a sluggish start by the hosts at the University of Bath to open up a 17-13 lead during the second quarter. Substitutions from head coach Anna Mayes midway through the quarter made the difference for England, who are ranked third in the world, three above places above the Proteas. Jo Harten was replaced, with Cookey moving to goal shooter and Kadeen Corbin coming on at goal attack, and within minutes England had moved into a 21-19 lead. At the start of the second half Corbin moved to goal shooter, with Cookey returning to goal attack, and only three minutes later the hosts had extended their lead to 29-23. South Africa shooter Melissa Myburgh looked lively inside the semi-circle against the England defensive pair of Eboni Beckford Chambers and Stacey Francis. But the visitors failed to capitalise on their possession and the hosts' superior experience saw them pull well clear by the final whistle, although the scoreline did not reflect how tight the game had been at times. England coach Mayes admitted: "Some of our great play was spoilt by ill discipline. I'm pleased with the people who came off the bench and made an immediate impact and I'm pleased with Mia Ritchie who really opened up the attack. It's a great asset to us that we can switch up attack."